♦ Class I and II -‘International Day of Peace’ was celebrated and students were told about the importance of peace, harmony as well as brotherhood. ( Classes I to V ) Excellence is the gradual result of always striving to do better. 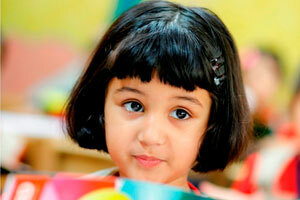 At this age, children are encouraged to make healthy adjustments in school. The classroom learning is made more meaningful and enjoyable. A long standing relationship with formal and informal learning situations is inculcated to make them ready for more abstract academic challenges. These are realised through XSEED curriculum. XSEED builds a strong foundation of concepts for students by using experimental and research based methods to ensure that all the students understand all concepts at school. Its purpose is to ensure that each child passes out of school with sound understanding of concepts, a confidence in himself/herself, an ability to communicate proficiently and a life-long yearning to learn. XSEED is developed by alumni of Harvard and Cambridge, IIMs, IITs and former teachers from leading schools. It is a tool that we use to teach the syllabus prescribed under National Curriculum Framework and guidelines of Indian Examination Board. XSEED promotes a child's interest in studies by creating classroom transactions that assist teachers in making the students experience the concepts, thereby generating motivation and curiosity. These understanding of concepts, help build a strong foundation. It aims to eliminate rote learning and promote true understanding of concepts. Several innovative methods are used to teach the subjects in a way that ensures understanding for a diverse set of learners. First hand observation, experimentation, and application to real-life contexts form an integral part of the XSEED learning process. Thus, the program goes beyond textbooks and digital content that largely focuses on Listening and Learning, or Reading and Learning.